Cloth n Paper: SPRING IS DEFINITELY HERE! I have just had a fabulous runaway to Jasper in this glorious weather. My husband and I ran around Geocaching. Our second stint of treasure hunting in the Jasper area. We are now over 70 caches found. I must post them today as well so I can add more smilies to my Geocache site. Hinton has a new quilt fabric shop called The Hen House. They are in a lovely bright space that was the Husquvarna dealership. Alas they do not carry sewing machines so that means that all of my friends and former students from Hinton will be coming into Edmonton to purchase their sewing machines. I hope they all stop to visit me. Drop in to the Hen House when you are travelling toward Jasper. It is a block from the Information centre and across the street from the elementary school. Say hi to Sue for me. On other news - sadly the lovely shop Stychen Tyme in Jasper is closing...unless you want to buy it. They carry a great selection of quilting fabric and supplies as well as lots of great knitting or weaving yarn. They have a great sale on now 30 to 50% off of everything. Of course I couldn't resist purchasing yarn. Now I will have to add the equal amount to my retirement fund. I am also a member of the Edmonton Calligraphic Society and for entering a post card in their ongoing guild exhibit, my name was drawn for a gift card to the Paint Spot. They have a 30% off sale this Thursday, May 9th, just in time for Mother's Day. Put in your order. The ECS has several exhibits coming up. One will be at the Grey Nuns Hospital on the maternity floor for June until September; the second will be a small exhibit at the Paint Spot Nuess Gallery in the fall. I already have one piece nearly finished. The Edmonton Weavers Guild and the ECS are planning their windup banquets and they are always fun. Join in. Have a look at the websites for both of these organizations. Maybe you too would like to join. The Edmonton Quilters Guild is having their annual exhibit on June 8 and 9th at the Central Lions Seniors Centre 11113 - 113 St. Check the EDQG for times and entrance fees. The annual Heritage Park Festival of Quilts is being held on May 25 and 26. A newly formed group called The Alberta Quilt Study Society will be joining the festival this year to promote their project of studying and registering Alberta quilts. My friend Helena Perkins will be doing a presentation called What's In Your Quilt on Saturday afternoon. Check out their website for more details. Well I have had a lovely read of the Country Register this weekend and plan to visit exhibits and shops over the summer while Mark and I are driving around Alberta camping and geocaching. I hope that many of you will plan to participate in at least a few of the many activities relating to your 'string theory' addiciton. 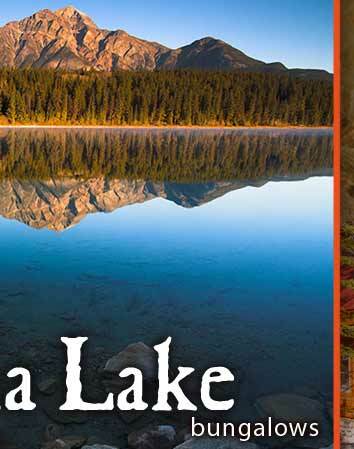 Patricial Lake Bungalows is the place we stayed in Jasper- Peace, Postcards, Projects. It was Perfect! More soon on upcoming plans for the Saskatchewan Stitchers Conference at the end of May. The arts show is this week and I am going to be in it.... I hope I do not disappoint. I will bring my finished blue and sun printing to show you.